Hoover carpet cleaners are the perfect solution for daily emerging cleaning challenges, such as spilled liquid, broken glass, sprinkled cereal or flour and others. With its cleaning equipment you can be sure that, when an emergency happens, you have a loyal assistant which can help you cope with almost any cleaning problem in the shortest time. The series of professional Hoover carpet washers has recently been enlarged with 3 units: Dual Power, Dual Power Max and Dual Power Pro. All three models are lightweight upright carpet cleaners with two-tank systems. However, they have very different technical characteristics. They also differ in price. Depending on your requirements and budget, you can choose the model that meets your requirements. More comprehensive info about each device is provided in the video and overview bellow. 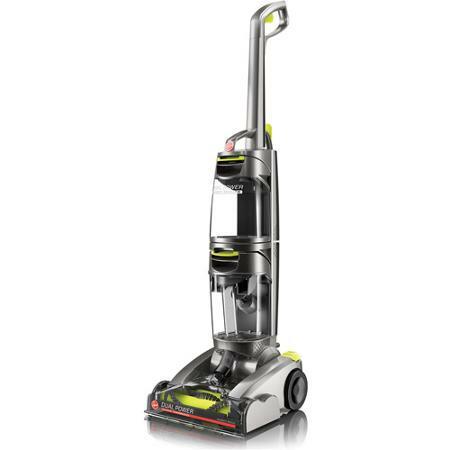 For those of you who are looking for a high-class carpet washer Hoover has designed the most innovative model of the Dual Power line. It is the Dual Power Pro Carpet Washer, FH51200. Its 15-inch nozzle covers large areas and makes the cleaning process fast and enjoyable. But the main feature that makes this model unique and super effective is the DualTech cleaning tool. This system is a combination of the Hoover’s well-known SpinScrub tool and their new know-how – the Roller Brush. This model’s main distinction is the new DualSpin Max Powerbrushes. They clean carpet fibers vertically. Such cleaning system has got very positive reviews from our customers. Plus, the Dual Power Max is equipped with a very powerful, 10 amps motor. Together with this appliance you will get a hose and brushes for cleaning textile. The Hoover FH51000 is mainly used for washing large areas like big rooms, but its small weight allows you to wash carpeted stairs as well. Most of our buyers were satisfied with this device, but we also got a few complaints. Some users had problems with belts in the cleaning system. You can read more about this issue in Full Review. This representative of Dual Power line is the most simple and lightweight. It is ideal for cleaning small zones like rugs or spots. You can also clean small apartments with it. This model is a simplified form of the Hoover Power Path Deluxe Carpet Washer FH50951. Though, the Hoover Power Path Deluxe may be used for washing sofas and couches because it goes in a package with an upholstery brush and a hose. The Dual Power Carpet Washer FH50900 is sent without any additional cleaning tools. 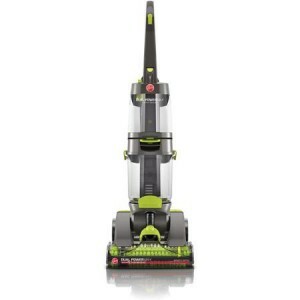 This model is comparable to the Hoover Power Path Pro Advanced. Though, the Dual Power Pro has wider cleaning nozzle and a useful Clean Boost Control function which allows users to spray more cleaning solution on especially dirty areas. Unfortunately, the Hoover Dual Power Pro cannot be used for stain release on hard floor. If you are looking for a device that can clean hard floor, you should pay attention to the Hoover Power Path Pro Advanced FH51102. 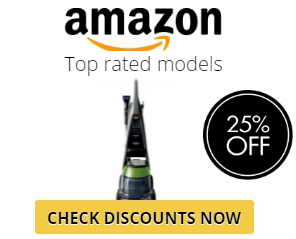 It is also important to mention that the Hoover Dual Power Pro has got the best customer reviews out of all the three Dual Power models. The key distinction of the three Dual Power models from all other Hoover carpet cleaners is their brush rolls. The standard carpet washers, like the Hoover Power Scrub and the Hoover SteamVac, are provided with the well-recognized SpinScrub brushes. As was mentioned before, both cleaning system are proven to be very effective. The main difference between them is that the brush rolls clean fibers vertically, when the Spin&Scrub brushing tool takes the dirt horizontally. But then again, the Hoover Dual Power Pro provides customers with the exclusive Hoover DualTECH technology. It is a combination of both types of tools. According to customers’ reviews, we can state that the Dual Power Pro FH51200 works best of all other Dual Power models. It also has less complains about improper functioning of the belts. If you still have worries about whether these machines are a good investment, just click on a banner above and read the original reviews of customers. Hope they will present you with all the responses you need.